In the hunt for innovation, that elusive path to economic growth and corporate prosperity, try a little jazz as an inspirational metaphor. 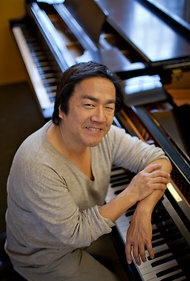 In business as in jazz, the tension between training and improvisation can result in great new works, says John Kao, the innovation adviser (and pianist). That’s the message that John Kao, an innovation adviser to corporations and governments — who is also a jazz pianist — was to deliver in a performance and talk on Saturday at the World Economic Forum in Davos, Switzerland. Jazz, Mr. Kao says, demonstrates some of the tensions in innovation, between training and discipline on one side and improvised creativity on the other. In business, as in jazz, the interaction of those two sides, the yin and the yang of innovation, fuels new ideas and products. The mixture varies by company. Mr. Kao points to the very different models of innovation represented by Google and Apple, two powerhouses of Silicon Valley, the world’s epicenter of corporate creativity. The Google model relies on rapid experimentation and data. The company constantly refines its search, advertising marketplace, e-mail and other services, depending on how people use its online offerings. It takes a bottom-up approach: customers are participants, essentially becoming partners in product design. The Apple model is more edited, intuitive and top-down. When asked what market research went into the company’s elegant product designs, Steve Jobs had a standard answer: none. “It’s not the consumers’ job to know what they want,” he would add. Google speaks to the power of data-driven decision-making, and of online experimentation and networked communication. The same Internet-era tools enable crowd-sourced collaboration as well as the rapid testing of product ideas — the essence of the lean start-up method so popular in Silicon Valley and elsewhere. “These are business and management innovations lubricated by technology,” says Thomas R. Eisenmann, a professor at the Harvard Business School. The benefits, experts say, are most apparent in markets like Internet software, online commerce and mobile applications for smartphones and tablets. “The cost of creation, distribution and failure is low, so it takes relatively little time, money and effort to float trial balloons,” says Randy Komisar, a partner in Kleiner Perkins Caufield & Byers, the venture capital firm, and a lecturer on entrepreneurship at Stanford. That style of innovation is being applied well beyond Google’s products and Internet start-ups. The National Science Foundation, for example, is embracing the formula to try to increase commercialization of the university research it finances. Last fall, the foundation announced the first of a series of grants for what it calls the N.S.F. Innovation Corps. The 21 three-member teams received a crash course at Stanford in lean start-up techniques, and have been given $50,000 each and six months to test whether their inventions are marketable. The lean formula, with its emphasis on constantly testing ideas and products with customers, amounts to applying “the scientific method to market-opportunity identification,” says Errol B. Arkilic, program director at the foundation. Successful innovation, Mr. Saffo observes, requires “an odd blend of certainty and openness to new information.” In other words, it is a blend of top-down and bottom-up discovery. A century later, the corporate labs at G.E. are trying to quicken the pace of innovation — but this is long-cycle innovation, since G.E.’s power generators, jet engines and medical-imaging equipment last for decades. The company is opening a software center in Northern California to make its machines more intelligent with data-gathering sensors, wireless communications and predictive algorithms. The goal is to develop machines, such as jet engines or power turbines, that can alert their human minders when they need repairs, before equipment failures occur. Such smarter machines, the company says, are early arrivals in what it calls the Industrial Internet. To tap outsider ideas, G.E.’s research arm has made investments with venture capital funds in clean-energy technology and health care, and it works with corporations, government labs and universities on hundreds of collaborative projects. “We’re much more externally focused and connected to the outside world than we were several years ago,” says Michael Idelchik, G.E.’s vice president of advanced technologies. Apple’s smartphones, tablets and computers typically have life spans measured in a few years instead of decades, with new models introduced regularly. But like G.E., Apple is in the hardware business, where innovation cycles are beholden to the limits of materials science and manufacturing. Apple’s physical world is far different from Google’s realm of Internet software, where writing a few lines of new code can change a product instantly. The careful melding of hardware with software in Apple’s popular products is a challenge in multidisciplinary systems design that must be orchestrated by a guiding hand — though it will no longer be the hand of Mr. Jobs, who died last October. Yet Apple has also repeatedly displayed its openness to new ideas and influences, as exemplified by the visit that Mr. Jobs made to the Palo Alto research center of Xerox in 1979. He saw an experimental computer with a point-and-click mouse and graphical on-screen icons, which he adopted at Apple. It later became the standard for the personal computer industry. In 2010, Apple bought Siri, a personal assistant application for smartphones. At the time, it was a small start-up in Silicon Valley that originated as a program funded by theDefense Advanced Research Projects Agency of the Pentagon. Last year, Siri became the talking question-answering application on iPhones. Apple product designs may not be determined by traditional market research, focus groups or online experiments. But its top leaders, recruited by Mr. Jobs, are tireless seekers in an information-gathering network on subjects ranging from microchip technology to popular culture. “It’s a lot of data crunched in a nonlinear way in the right brain,” saysErik Brynjolfsson, director of the M.I.T. Center for Digital Business. 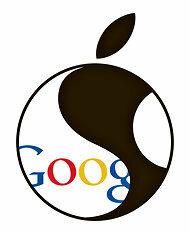 Apple and Google pursue very different paths to innovation, but the gap between their two models may be closing a bit. In the months after Larry Page, the Google co-founder, took over as chief executive last April, the company eliminated a diverse collection of more than two dozen projects, a nudge toward top-down leadership. And Timothy D. Cook, Apple’s C.E.O., will almost surely be a more bottom-up leader than Mr. Jobs. Newer PostFacebook's IPO: More Yahoo than Google?